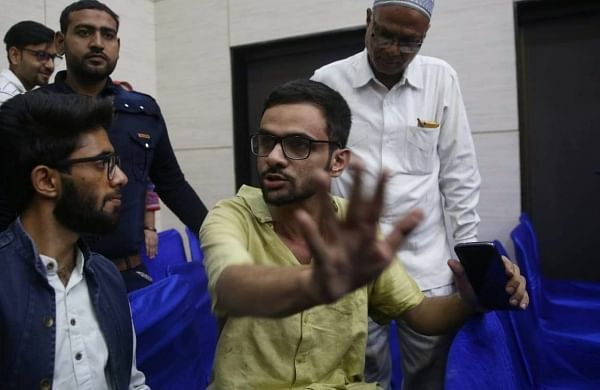 NEW DELHI: In a video uploaded on social media, two men claimed responsibility for the attack on JNU student leader Umar Khalid in an upscale neighborhood in Delhi on Monday and said they would surrender for the police tomorrow. The police are looking for the two men who were shown in the video that was uploaded on Facebook yesterday. In the video, the duo, who identified himself as Darwesh Shahpur and Naveen Dalal, the attack claimed an "Independence Day gift" was for the citizens. The police verify the authenticity of the video and try to trace the IP address from where it was uploaded. The duo also asked the police not to bother anyone and said that they would surrender to the village of Sikh revolutionary Kartar Singh Sarabha on 17 August. A police team has been sent to the village. city police contacted his counterparts in Punjab and Haryana to trace the two. Meanwhile, Jawaharlal Nehru University (JNU) students and teachers along with Khalid today held a protest in Parliament Street against the incident. The protest was previously planned by Jantar Mantar, but after the police had informed the participants that the guidelines for protests on the site still had to be framed, the Protestants drew near Palika Kendra. From Palika Kendra they marched until the police station of Parliament Street demanded the arrest of the accused in the case. "I would like to thank the Modi government for killing fear in us, there is no longer any fear in us because of what we have been through for the past four years, from a media lawsuit against us to sending us to prison, you did everything you can, "Khalid said at the protest site. He said that even if he died, the battle would continue. "I have no personal hatred for those who tried to kill me, I feel sorry for those people who tried to kill me because they're being used by the government, and that's what their families are worried about." JNU student. "The real culprits are those who have campaigned against me over the past two and a half years, calling me" antinational "and these include spokespersons, certain news anchors and channels," he said. Khalid was attacked Monday when he was on his way to participate in an event in the Constitution Club here.
] On Tuesday, the Delhi police handed the case to his special cell, which has already been questioning a riot against Khalid and two other JNU students. A policeman, initiated by the probe, said that the police had used the weapon used in the crime and a preliminary forensic investigation suggested that the gun was stuck when it was used against Khalid. He said they still had to determine if shots were fired if no empty wagon backs were found on the spot. A case of attempted murder was recorded by the police in the incident.